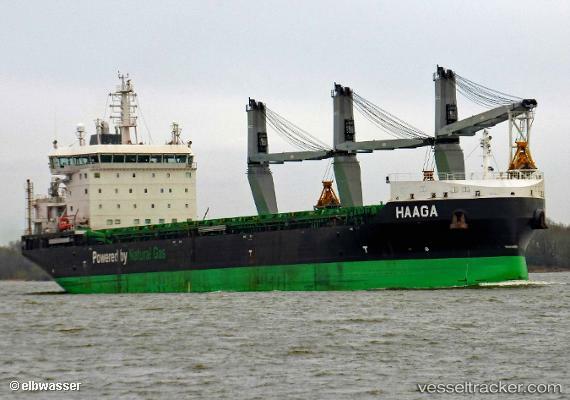 Finland-based shipping company ESL Shipping, part of the ASPO Group, has decided to reflag its new LNG-fueled bulk carrier Haaga to the Finnish flag. The flag change took place in Kokkola, Finland, on March 7, 2019. Previously, the 25,500 dwt newbuilding was flying the flag of Portugal. This was criticized by workers unions but the company has now managed to reach an agreement with them. The new bulk carriers Viikki and Haaga have started operating on the Baltic Sea. ESL Shipping says the 25,600-dwt vessels, 160 metres long and fuelled by liquefied natural gas, produces less than half of the carbon dioxide of previous vessel generation, thanks to LNG and many advanced technologies. Both vessels were built in China, and after completion first sailed to Japan to load a cargo of raw materials. From there, they arrived to the Baltic Sea through the Northeast Passage, which shortened the journey from Japan by three weeks and reduced the emissions of the journey by 40 per cent compared with going through the Panama Canal. The Finnish shipping company ESL Shipping Ltd., part of Aspo Plc., and Hamburg based Nauticor GmbH & Co. KG, a 100% subsidiary of The Linde Group, have signed a long-term contract for the supply of Liquefied Natural Gas (LNG) in the port of Oxelösund. The contract contains the provision of the environmental-friendly fuel for the handy size bulk carriers “Haaga” and “Viikki”.